Farmer’s Market Ratatouille Stew: A comforting eggplant vegetable stew made with farm fresh ingredients. This is the perfect comfort dish to make when you want to use up all the garden’s bounty. Vegan. Gluten Free. Paleo. Do you have an over abudance of fresh produce from your garden? Has your zucchini overtaken everything or are you begging people to take your fresh tomatoes? Well, good for you! That is NOT me!! Unfortunately, I have been cursed with a black thumb. 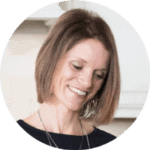 I grew up with a backyard garden that always prospered and my husband grew up on a huge farm. You would think we would be pros at the whole garden thing. Nope. Not happening. Even after we had a soil analysis done and invested tons of money into creating the “perfect” pH and balance of nutrients. It is really quite sad. I am beyond thankful for my CSA and farmer’s market. I am blessed with beautiful produce that I was not given the opportunity to kill. 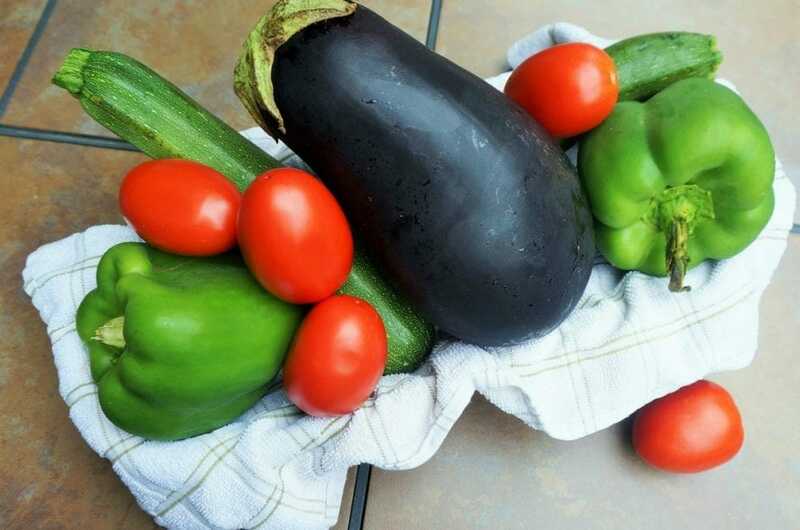 My latest finds were what are typical this time of year–zucchini, eggplant, green peppers, and tomatoes. Which really worked to my advantage because I was craving Ratatouille. 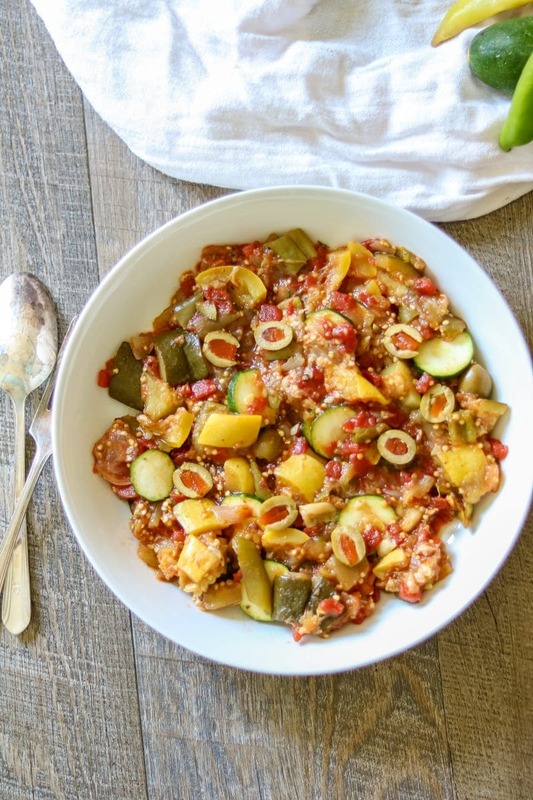 Ratatouille is the perfect dish to use up any abundance of vegetables your garden produces. Ratatouille is vegetable stew that originated from Provence, a region in France. This area is known for it’s farms and fresh produce. And this recipe for vegetable stew came as a result of all the farmer’s bounty. 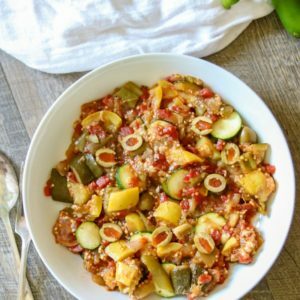 It’s common to find eggplant, tomatoes, onions, bell peppers, zucchini, garlic, and herbs ratatouille recipes. As long as you have an eggplant, you can essentially have this easy vegetable stew. You can replace yellow squash for the zucchini or red peppers for the green peppers. Throw in cherry tomatoes or beefsteak tomatoes, or roma tomatoes, as I did. If you are really lucky, use Heirloom tomatoes–just be sure to invite me over!! The first step is to prep your eggplant. You must peel and dice the eggplant. 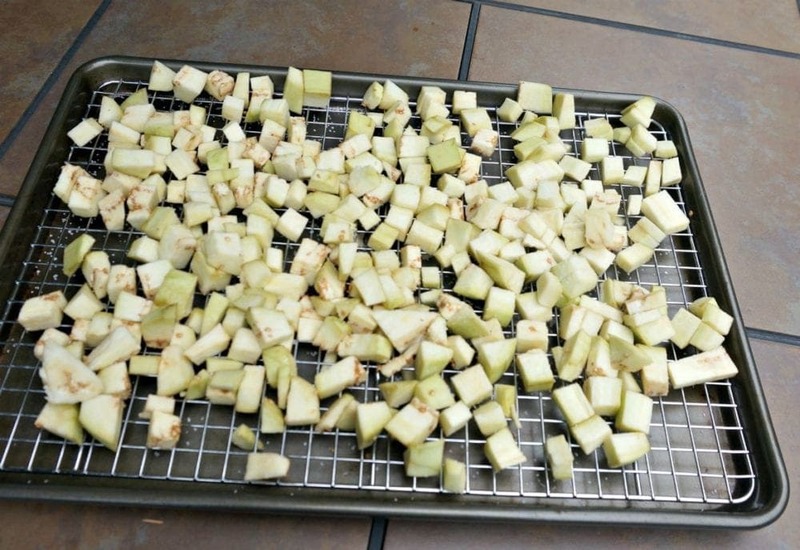 Then place on a drying rack over a cookie sheet or in a colander and salt well. This will release all the natural bitterness an eggplant has (and if you think you don’t like eggplant, you may have not had it prepared correctly which makes a world of difference.) I let the eggplant sit for about 30 minutes to an hour. 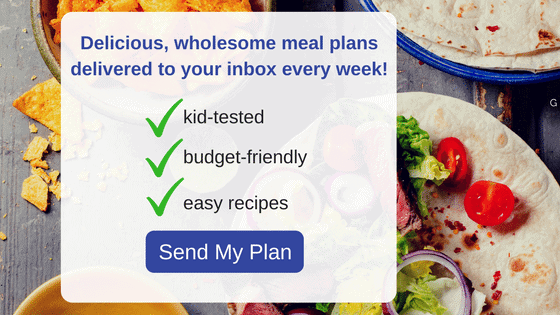 Prepare remaining vegetables for Ratatouille Recipe: The next step is really easy–get those chopped veggies stewing and prepare yourself for some pure veggie comfort! I use green olives instead of black olives. I am just not a fan of regular old olives. Kalamata would be good as well. Use high quality olive oil in this recipe as it gives the veggies so much flavor. I love to top this with sour cream or Greek yogurt–that little bit of tang and creaminess adds so much. Omit for Paleo or Vegan. This dish is fabulous when soaked up with crusty French bread, but easily a meal on it’s own. If you don’t wish to use fresh tomatoes, use a 15 ounce can of plum tomatoes. An easy, traditional vegan ratatouille recipe, otherwise known as an eggplant stew. 2 cups seeded peeled,and quartered tomatoes (or one 15 ounce can whole plum tomatoes. Prepare eggplant. Peel and seed tomatoes, if using fresh tomatoes. Chop veggies. Heat oil in large dutch oven or sauce pan over medium heat. Add in onion and garlic and allow to saute for 5-7 minutes. Add in remaining vegetables, olives, oregano, and prepared eggplant. Simmer covered for about 45 minutes. Remove lid and turn up the heat to medium and allow to cook for 15 additional minutes to reduce liquid. Serve with a drizzle of olive oil and sour cream if desired. Such a a great idea. Well, this is a GREAT way to use up what you have. Gorgeous eggplant stew Kristen! Great use of produce, love roasting veggies. I was also cursed with a black thumb. Some years are better than others. This year my basil is going crazy but my tomatoes are low producers….go figure. So funny, I am so envious of hose people why say they have so much left over fresh produce! I also have a black thumb! This looks amazing, gotta love your CSA! Glad I am not alone with my black thumb. I am cursed!! This looks AMAZING! So simple and yummy. 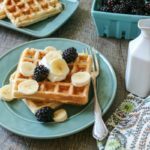 I love anything with fresh veggies – I need to try this one! I just love Ratatouille! All of my favorite veggies in one bowl. I love your green olive addition! I love the green olives as well–so much better than black olives in my opinion. CSAs are the perfect solution for those who don’t have green thumbs (or good soil)! 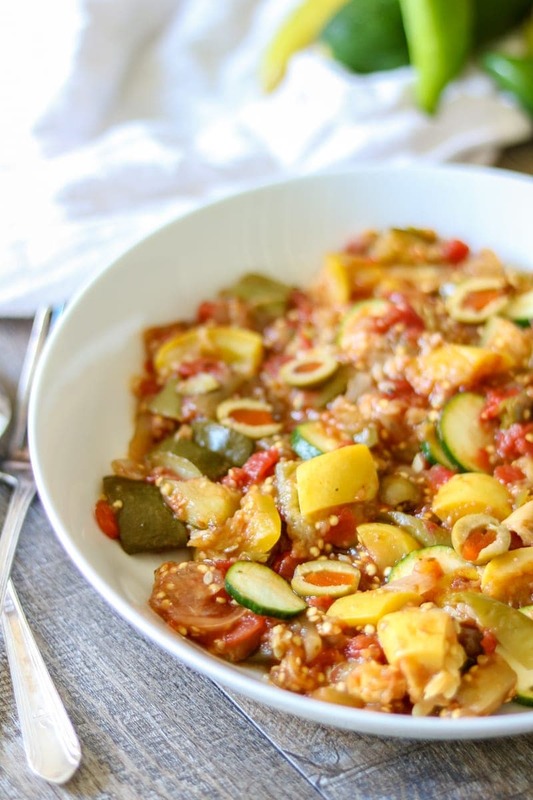 I love that you made this summer ratatouille — so many good things out there right now! This looks so good – I can imagine it goes well with crunchy bread! Patricia, crusty bread is the best with this!! Oh wow this looks so good, so healthy and so easy! Came across your post on the Two Cup Tuesday link party. Glad I did because I am a produce hoarder and sometimes need some new, fresh ideas! Glad this recipe can inspire you. And in my opinion, you can NEVER have enough produce! I have a black thumb too! I can’t keep fake plants alive:( I have to steal all my fresh herbs from my mother in law or my friend Chrissy’s house. Maybe the soil at the new house will be better! Wow! This is a perfect summer meal! Love the addition of green olives! I would enjoy it with some homemade yogurt. YUM! Oh yes, homemade yogurt it a great idea Zerrin! Glad you enjoyed.